The 2016 PVGrows Forum is three weeks away! Please join us March 9th at Gateway City Arts in Holyoke, Mass. from Noon – 5pm. This year, the Forum centers around the topic “Local Food, Healthy Communities.” Register Today! 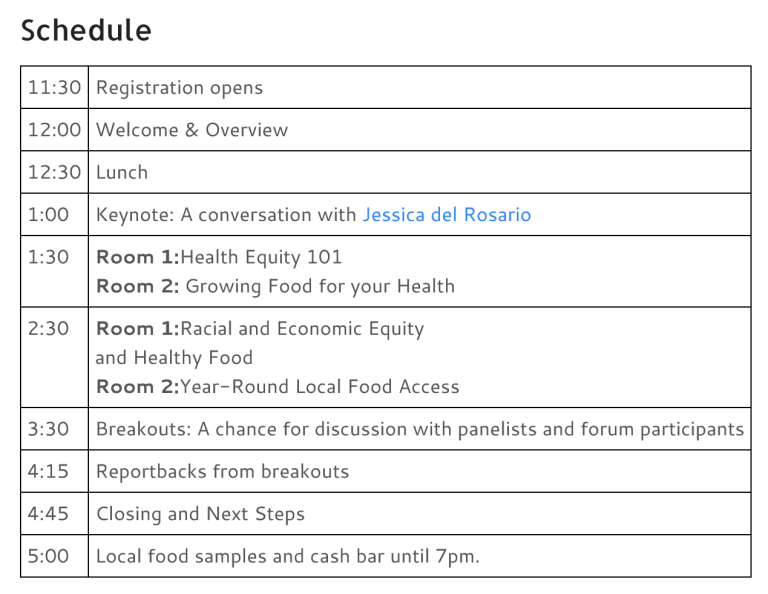 The 2016 PVGrows Forum will examine the ways in which health and local food are connected, and specifically how issues of access, affordability and equity in our local food system impact health outcomes for our communities, and disproportionately so for poor communities and communities of color. 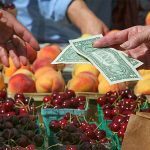 At the 2016 Spring Forum, we will deepen the dialogue and working relationships between the healthcare sector and the local food movement, identify barriers to healthy local food, and highlight work that is already increasing the availability of locally grown food for individuals and institutions. We’re excited to announce this year’s keynote session: A Conversation with Jessica del Rosario. Jessica del Rosario is Project Director for the Massachusetts Convergence Partnership, a collaborative of foundations and health-care organizations working to advance health equity for all. She led a statewide workgroup that developed policy, programmatic, and research recommendations for the Massachusetts Local Food Action Plan in the areas of food access, security, and health. She is now on the steering committee for the Massachusetts Food System Collaborative, an entity promoting and facilitating implementation of the Plan. And after a jam-packed afternoon of problem-solving, we invite you to stay and chat with your fellow attendees, while enjoying a drink and samples from local food businesses. PVGrows Forums are annual events that bring 100-150 people interested in the food system of the Pioneer Valley together to spend a day deeply exploring one crucial topic. Throughout the Forum, we aim to find opportunities for collaborative action. 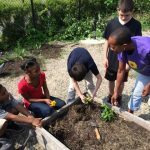 2016 PVGrows Forum: Local Food, Healthy Communities – Register Now! This year’s generous SPONSORS of the 2016 PVGrows Forum include: The UMass Center for Agriculture, Food and the Environment, Common Capital, Cooley Dickinson Hospital, Cooperative Fund of New England, Farm Credit East, Franklin Community Coop, Franklin Land Trust, Franklin County Community Development Corporation , Greenfield Community College, Grow Food Northampton, Mass in Motion, Mt. Grace Land Conservation Trust, Partners HealthCare, Real Pickles, River Valley Market, and the Stockbridge School of Agriculture at UMass. To sponsor the Forum and join this list, contact libby@pvgrows.net.